So wrote Ted Saucier in 1951 when introducing this drink in Bottoms Up. Saucier credits the drink to the Detroit Athletic Club, and if the bartender’s recollection is correct, that would place the Last Word as a Prohibition-era cocktail. If that’s the case, then the Last Word is one of the finest cocktails to come out of that bleak period in American history. Four ingredients–two of them fairly exotic–working in equal parts to create perfect harmony. I first experienced this drink last summer, when the recipe initially caught my attention. Later, I found out that it’s on the specialty cocktails menu at the Zig Zag Cafe, and since then I’ve been allowing myself the luxury of having Murray make them for me. From what Chris says over at Boston Cocktails, apparently the Last Word is getting around, showing up on the cocktail list at B-Side Lounge. And according to an old post on eGullet’s Fine Spirits & Cocktails Forum, Pegu Club in New York offers a variation on the Last Word, subsituting rye for the gin and lemon juice for the lime juice. That’s a great version as well, but for depth and complexity of flavor matched up with an elegant look in the glass, it’s hard to beat the Last Word. Shake well with ice and strain into chilled cocktail glass. Shut up and drink. I have to say, I was skeptical about the amount of maraschino. While maraschino plays very well with lime (e.g., El Floridita Daiquiri), I have always felt the need to under pour its proportion relative to recipes, because even a small amount carries a big flavor. All of this being said, I made the Last Word to the recipe’s proportions, and it is fantastic! Wow, perfect timing to go into the summer cocktail rotation. I really can’t say enough good about the Last Word; the intricate array of flavors is nearly overwhelming balanced. Paul, I noticed that you have bombay in your picture. Is that your workhorse gin? I’ve been using Gordon’s as mine for some time now and only breaking out others for gin and tonics and martinis (granted, Gordon’s worked surprisingly well in my cocktail chill experiment). I completely agree. I had a friend taste the drink and guess its contents, and maraschino was the third ingredient he named! I wonder what other intensely flavored liquors can balance each other out like Chartreuse and maraschino liqueur? It’s amazing that the Last Word works so well, considering it’s half liqueur (and two strongly flavored liqueurs, at that). There’s a weird synchronicity between the maraschino and the Chartreuse, where each seems to cancel out the other’s overwhelming qualities without drowning out the essential flavor. 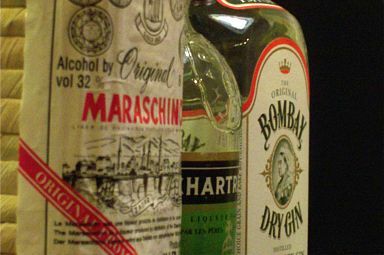 Bombay (original, not Sapphire) is my usual go-to gin for mixing. I think it has a nice, rounded flavor without any one characteristic hanging out there too much, so you can taste gin in the cocktail without tasting ONLY gin in the cocktail. There are exceptions, of course–for drinks such as martinis, where the gin flavor is more up-front, I prefer the round, citrusy taste of Plymouth or the soft florals of Hendricks. I’ve found Gordon’s to be too monochromatic, with too assertive a juniper taste, for a lot of cocktails, though I’ll occasionally use it in something such as a rickey or a Tom Collins, in which the gin flavor is so subdued by the other ingredients that a gin like Plymouth or Bombay would be completely lost in the mix. Recently, when drinking in a bar, I’ve taken to ordering martinis as my first cocktail of the evening, asking for a different gin each time (though I think I went back to Old Raj a couple of times, it was so tasty), to gain a better understanding of each product. A pleasant, and effective, educational tool. I just mixed up a Last Word, and I’m still amazed at how all these intense ingredients work together. I wish more cocktails of this caliber were easily accessible. The limes were small so I squeezed one to let it be the deciding measure for the equal portions of ingredients. The drink was truly a masterpiece of mixology; such a complex aroma and diverse contrasting of flavors. And I so much appreciate the even proportions of ingredients making it so easy to make as small or big a drink as meets to occasion and also easy to “tweak” to portions to one desire. A perfect cocktail of significant interest. Enjoy! For me the Maraschino is too dominant. Try mixing one with less than the called for portion. As you ratchet it down, the Chartreuse comes through. Same for the lime. Had my very first one yesterday and was well amazed. It now ranks high on the list of my favourite cocktails. I think the citrus-forward gins like Plymouth, (my workhorse) and Bombay get lost in this one. It really popped for me when I started using Tanqueray. Can someone help me out here? I am failing to understand how a drink could have been created at the Detroit Athletic Club during prohibition. My natural assumption would be that Saucier’s “about thirty years ago” must leave at least a few years’ room, such that 1919 would be a perfectly acceptable (and much more reasonable) guess for its time of creation. Unless the Detroit Athletic Club was a notorious speakeasy of which I’m unaware. Any thoughts? They made me one of these at the Roger Room in L.A. last week. I had been there several times and always enjoyed the drinks, but I wanted to try something new so I asked the waiter to have the bartender give me something off the menu. This was the drink that resulted, and I loved it and plan to order it again. I’m late to the party, but was looking around the internet for an interesting use of Chartreuse. This may be my new favorite cocktail. It’s outstanding! Classic cocktails with suprising amounts of previously thought “dash” ingredients (the maraschino liquer in this case). Just goes to show what true chemists these old school bartenders actually were. Fantastic drink. Do yourselves a favor, follow this drink with a corpse reviver #2, they really compliment each other. Best cocktail yet. We tried with dry gin, genever and rye. All good, all different, but stil balanced. My wife preferred the rye. I liked genever. But we both would drink in any combination. A true standout. Thanks for the recipe.